Partnerships are intended to de-risk a project, but carry risks of their own,” Judy Brown, the Chief Advisor for External Affairs in the East Pacific and Latin America at Rio Tinto and a veteran of field-level sustainability work, advised a group of 15 students in the Georgetown Master of Science in Foreign Service program. For both the public and private sector, the advent of the United Nations Sustainable Development Goals (SDGs) make partnerships that catalyze the development of local markets especially important. Brown had joined Whitney Shinkle, a senior advisor to Bancroft Global Development, and me to speak with my class on public-private partnerships about the ethics, risks, and benefits of partnering with local governments and NGOs, something large companies are increasingly being called on to do. Good will and shared objectives are rarely enough to make such partnerships successful. Risks abound. Collaboration between partners who often speak a different language, function with different incentive structures, and are held accountable to different interests is a complex undertaking. Understanding the risks helps to set the right expectations and create a stronger foundation of partnership. Bancroft Global Development, where Shinkle serves as a strategic advisor, invests primarily in fragile and conflict markets—high-risk environments, where all partnerships carry economic, social, and political risk. “All partnerships are inherently political,” Shinkle warned the class. In partnership with the local government and international institutions, Bancroft seeks to help establish stability and build local capacity with the objective of kick-starting investment and growth. By nature, the company partners with weak or non-existent institutions, dominated by local personalities. Like Bancroft, Rio Tinto, a global mining operation, often operates in fragile markets with weak governance. As with all extractive industries, they are further at risk due to their timeframe and level of investment, typically investing billions of dollars in one community over decades, unlike pharmaceutical or technology companies, which target global consumers and can more easily shift to other markets if investments don’t pan out. Most importantly, Rio Tinto derives its revenue directly from the ground and must preserve its license to operate in its local communities, which makes the company acutely aware of how important partnerships are, but also how vulnerable they are to their risks. In her presentation, Brown recounted how Rio Tinto evaluates partnerships to de-risk an investment, calling on international organizations and NGOs to help build local capacity and bring in environmental expertise. Yet, local partnerships are required too. Together with the class, Brown and Shinkle discussed six risks and concerns they address when thinking about partnerships, including upsetting the local political environment, dealing with weak institutions, understanding the power of sovereign partners, and promoting the necessity of building sustainable outcomes. 1. Partnerships Create Winners and Losers: Partnerships are designed to address important social or economic goals but have important political consequences. As Shinkle has written elsewhere, the influx of money into fragile markets has the potential to influence the balance of power among political players in the environment, helping one important power broker while hurting another. Certain changes, while positive in the long run may undermine parties with an interest in the short run, giving them incentive to interfere with programs. Wherever corporate money, resources, expertise, and technology are invested, they create a ripple effect, explicitly or implicitly benefiting someone, often at the real or perceived expense of someone else. Local people, especially in fragile or conflict environments, are hyper-aware of these potential up- and down-sides. 2. Partnerships Must be Locally Sustainable and Integrated into the Local Economy: There are many ways companies can both solve problems while advancing social and economic development, but partnerships that are adapted to the local context and avoid skewing the economy by imposing technological or financial costs that require indefinite external support, can optimally serve both the investor and the community. 3. Companies Can’t Always Choose Their Partner: Most partnerships in these environments involve a government sovereign, who, by position, holds more power in the relationship and can pull out without warning, often without legal recourse for the non-sovereign partner. Moreover, sovereign partners, particularly in fragile or conflict economies, are vulnerable to leadership changes, which leaves the partnership vulnerable to political conditions on the ground as demands on the partnership change. 4. Association Risks Extend Beyond Immediate Relationships: Due diligence is an important step in the creation of any partnership, but the risks generated by the potential partner extend beyond their immediate business circles. Understanding the activities of a partner’s partner is important as well. 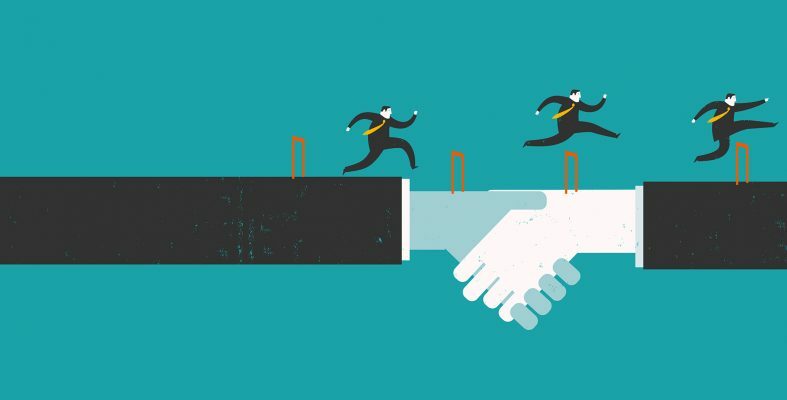 The partnership carries association risk, and the activity of associated third parties can have a negative impact on the company’s reputation or make the implementation of the partnership difficult. 5. Finding Effective Local Partners Can Be a Challenge: In Mongolia, Rio Tinto is required to use resources to build local capacity and local institutions, but there are few local groups capable of implementing them. “We put aside funds to build local capacity, but there are few in the country who can help us do it,” noted Brown. Finding local partners to absorb this kind of investment and create viable partnerships is challenging. For the time being, they have turned to international organizations and NGOs. 6. Ending Partnerships is More Complicated Than Starting Them: Once formed, it can be difficult to exit local partnerships, regardless of whether the objective has been achieved or not. Rio Tinto will be a stakeholder in a local community for decades over the full lifecycle of their investment, so dropping a local partner has political consequences, even if the shared project is no longer viable. When, why, and how to exit partnerships needs to be discussed and negotiated up front, so both partners understand what would justify exiting the partnership early (non-implementation) or what indicates the goal of the partnership has been achieved. By anticipating the end of partnerships at their start, companies can often avoid some of the negative effects that can arise at the end of a partnership. Faced with these kinds of challenges, Rio Tinto and Bancroft use various approaches to effectively mitigate risks. Education. Rio Tinto, who admits to underestimating the importance of understanding partnerships in the past, embarked on an intensive internal campaign to educate their employees on the value of building community relationships. In 2011, together with Georgetown’s McDonough School of Business and other universities, they developed a stakeholder engagement academy, to give employees the skills they need to development partnerships and engage the community. They have focused specifically on developing relationships with environmental NGO’s, entering into partnerships with international development agencies, and reaching out to local stakeholders. Due Diligence. Nothing is more important than understanding the incentives and capabilities of a partner, be it sovereign, private sector, or local NGO. Shinkle noted that due diligence requires understanding whether the partner is involved in transactions that would be ethically unacceptable. Brown reminded students that partners may commit to implementing a shared objective, but may not have the resources or expertise to meet their obligations. If a partnership is created to build a new school, for example, and the school was never completed, or there are no proficient teachers to work in the school, both partners will face local criticism and more damage to their local reputation than if nothing was attempted at all. Dynamic Evaluation. Risks are typically assessed when going into a partnership, but to be effective, Shinkle noted, “They need to be constantly monitored and updated as a partnership or investment is implemented.” As mentioned above, the partnership itself may change the political or economic situation on the ground, making it important to understand not only the risks going into an agreement, but how the project itself changes the ongoing context and nature of the partnership and the community it is supposed to impact. By learning from the experience of some of the most risk-prone companies, others can build strategic partnerships, jointly contribute to the development of the local market, and effectively build risk mitigation into their partnership from the beginning. Partnerships can be an effective way to build support among local stakeholders—but only if the partnership goes well. This is why an attention to risk mitigation must accompany an ambitious partnership strategy and the commitment to heed the call of the UN SDG’s to sustainable development.